Treating psoriatic arthritis: how effective are TNF antagonists? Psoriatic arthritis (PsA) is a seronegative spondyloarthropathy that commonly appears after the onset of the characteristic cutaneous lesions. This complication affects about 40% of patients with moderate to severe cutaneous disease. Analysis of synovial fluid and tissue in patients with PsA demonstrates a profile of high levels of tumor necrosis factor (TNF) plus other cytokines similar to those seen in patients with rheumatoid arthritis (RA). In the past, medical management of patients with this disease consisted of treatment with nonsteroidal anti-inflammatory agents. Patients with more severe disease have tried a number of different disease-modifying drugs including methotrexate, azathioprine, and gold salts. However, there is no evidence that these agents can arrest the progress of structural joint damage. Infliximab and etanercept are TNF antagonists that have demonstrated significant efficacy and safety in patients with RA. Clinical trials with these two agents in patients with PsA have shown significant improvement in the rheumatologic and cutaneous manifestations of the disease. Psoriasis is a chronic papulosquamous skin disease that affects about 2.6% of the United States population , with an equal distribution between men and women. Epidermal hyperplasia in patients with this disease is a result of T cell-mediated activation of the immune system in focal areas of the skin . Clinical manifestations of psoriasis can vary from a silent patch or two of disease to a generalized plaque or pustular disease or an exfoliative dermatitis. Dermatologists and rheumatologists often collaborate in the care of patients with psoriatic arthritis (PsA). PsA is a seronegative inflammatory arthritis associated with psoriasis and has been recognized as a specific disease entity distinct from rheumatoid arthritis (RA) . In a review of records of patients with psoriasis in Olmsted County, Minnesota, Shbeeb and colleagues reported that 6.25% of patients with disease confirmed by a dermatologist also had PsA . Gladman and colleagues investigated the presence of spinal involvement based on clinical and radiologic evidence in patients with moderate to severe psoriasis and showed that 35–40% of these patients have PsA [3, 5]. PsA most commonly presents as asymmetric oligoarthritis or polyarthritis with pain and stiffness that can involve all peripheral joints. The arthritis manifests as pain and swelling in the affected joints. There is no direct relationship between the severity of skin lesions and the degree of joint inflammation in PsA. Other clinical features of PsA include spondyloarthropathy, tenosynovitis, dactylitis, and enthesitis . Dactylitis occurs in more than 30% of patients and is characterized by a diffuse swelling of the entire digit. Although the exact cause of the cutaneous and musculoskeletal changes of psoriasis are unknown, they seem to be the result of a combination of genetic, immunologic, and environmental factors [7–10]. Activated T cells can be found in both the skin and joints of patients with PsA . Analysis of synovial tissue and fluid from patients with psoriatic arthritis reveals greatly increased levels of tumor necrosis factor (TNF) and other proinflamma-tory mediators [12, 13]. The cytokine pattern in the joint fluid is similar to that seen in patients with RA, a finding that generated the hypothesis that TNF antagonists might provide significant beneficial effects in patients with PsA. The direct costs of care for patients with psoriasis and its complications are estimated to exceed $600 million . Shbeeb and colleagues reported that outpatient clinic and office visits, hospitalizations, and procedures related to PsA accounted for almost 2% of all psoriasis-related direct medical costs . Although costs of medications directly related to treatment could not be precisely determined from the data, over-the-counter medication costs, which included both nonsteroidal anti-inflammatory drugs (NSAIDs) and topical dermatologic preparations, comprised more than half of all direct care costs. This article describes evolving evidence that the TNF antagonists can optimize clinical outcomes in patients with PsA. The treatment of patients with PsA is directed at controlling the inflammatory process. Although there is no direct correlation between joint and skin inflammation in individual patients, both aspects of the disease need to be addressed. Treatment usually begins with NSAIDs for joint disease and topical therapies for the skin . Although there have been no specific trials of NSAIDs in patients with PsA, these agents are indicated in mild disease. However, patients with severe disease should be treated early and aggressively. Several agents, including methotrexate, sulfasalazine, cyclosporine A, azathioprine, and antimalarials, have been used in patients with persistent disease. In patients with severe skin inflammation, agents such as methotrexate, cyclosporine, oral retinoids, alefacept, and psoralen plus ultraviolet radiation have been shown to be effective for skin and joint manifestations [15–21]. Although these agents can help to control the symptomatic manifestations of the disease, there is no evidence that they prevent the progression of clinical and structural joint damage. Two-year trials of gold and methotrexate in patients with PsA have failed to provide evidence that either agent can arrest the progressive destruction of involved joints [22, 23]. There is therefore an unmet need for better therapies to optimize outcomes and prevent the joint damage seen in patients with PsA. Etanercept, a soluble 75 kDa TNF receptor coupled to part of the Fc fragment of human IgG1 , has been shown to be effective and safe (i.e. FDA approved) in patients with both PsA and RA and to inhibit the progression of structural joint disease . Mease and colleagues conducted a 12-week, randomized, double-blind, placebo-controlled trial to evaluate the efficacy and safety of etanercept in patients with PsA and psoriasis . Thirty patients received etanercept 25 mg twice weekly, administered subcutaneously, and 30 patients received placebo. Primary study end points for PsA included the proportions of patients who met the Psoriatic Arthritis Response Criteria (PsARC) and the American College of Rheumatology criteria for at least 20% improvement (ACR20). Improvement in the psoriasis area and severity index (PASI) was one of the end points for psoriasis. Study results at 12 weeks showed that 26 (87%) of the 30 etanercept-treated patients met the PsARC, compared with 7 (23%) of the 30 controls (P < 0.0001). 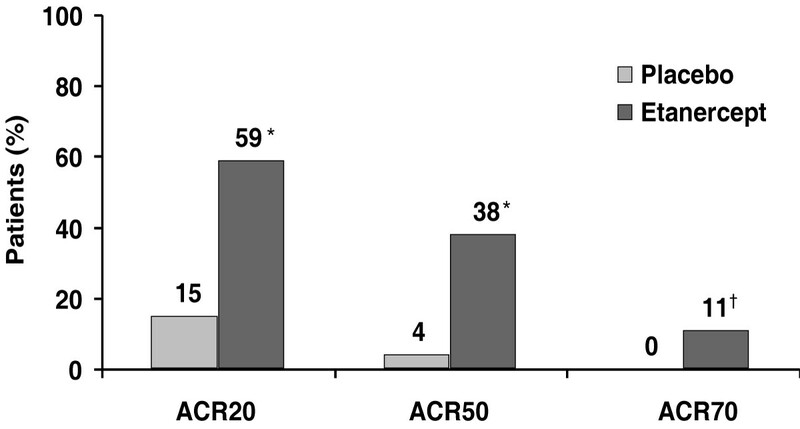 Twenty-two (73%) of the 30 etanercept-treated patients achieved ACR20 responses, compared with 4 (13%) of the 30 controls (P < 0.0001). The median improvement in the PASI was 46% in the etanercept-treated patients and 9% in the controls. No serious adverse events were reported in the patients receiving etanercept. On the basis of these study results, Mease and colleagues conducted a randomized, 24-week, double-blind, placebo-controlled trial in 205 patients who had an inadequate response to their current therapy . Inclusion criteria included stable plaque psoriasis with a qualifying target lesion, plus active PsA with at least three swollen and three tender joints. PsA was characterized by at least one manifestation of distal interphalangeal involvement, poly-articular disease, arthritis mutilans, asymmetric disease, or ankylosing spondylitis-like symptoms. Patients could continue on stable doses of NSAIDs, corticosteroids, and methotrexate at a dosage of less than 25 mg per week, but other therapeutic interventions, including disease-modifying antirheumatic drugs (DMARDs), psoralen, ultraviolet A and B radiation, topical steroids, vitamins A and D, anthralin, and oral retinoids were to be discontinued 2–4 weeks before the study. Patients who met the entry criteria were randomized to receive subcutaneous injections of etanercept 25 mg or placebo twice weekly. Study results at 12 weeks showed statistically significant improvement with etanercept, as demonstrated by the numbers of patients who achieved the ACR20 (P < 0.0001), the ACR50, indicating at least 50% improvement in ACR criteria (P < 0.0001), and the ACR70, indicating at least 70% improvement in ACR criteria (P = 0.009) compared with controls (Fig. 1) . These differences were still significantly greater than those observed in the controls at 24 weeks, but the response rates with etanercept did not improve from 12 weeks. At 24 weeks, the authors evaluated improvements in PASI in a subpopulation of patients with psoriasis over 3% or more of their body surface area. A 50% improvement in PSAI was recorded in 47% of etanercept-treated patients compared with 23% of controls, and a 75% improvement in PSAI was recorded in 18% of etanercept-treated patients compared with 3% of controls. Injection site reactions were the most frequently reported adverse event with etanercept, and occurred significantly more frequently than with placebo (P < 0.001). Otherwise, etanercept was well tolerated. Infliximab, a chimeric protein formed by a murine anti-TNF Fab fragment plus the constant region of human IgG1κ , has been shown to be effective and safe in patients with RA, to improve physical functioning, and to prevent the progression of structural joint disease . Several small studies have been conducted to evaluate the efficacy and safety of infliximab in patients with PsA. Van den Bosch and colleagues conducted a 12-week, double-blind, placebo-controlled trial in 40 patients with active spondyloarthropathy, 18 of whom had PsA . The primary study end point was improvement in patient and physician global assessments on a 100 mm visual analog scale. Patients were randomized to receive infliximab 5 mg/kg intravenously at 0, 2, and 6 weeks, or placebo. Although there were too few PsA patients on whom to conduct a separate analysis, the infliximab-treated patients demonstrated statistically significant improvement (P < 0.001) from baseline in patient global assessment, physician global assessment, erythrocyte sedimentation rate, and C-reactive protein level, compared with controls. Infliximab was generally well tolerated, although one patient developed disseminated tuberculosis. Cauza and colleagues evaluated the efficacy and safety of infliximab in nine patients with active psoriasis and PsA. Patients received five infusions of infliximab 3 mg/kg over 22 weeks . Infliximab produced ACR20, ACR50, and ACR70 responses in 89%, 56%, and 22% of the patients, respectively; these responses were sustained through 22 weeks of treatment. In addition, there was significant improvement (P = 0.002) in PASI scores. Infliximab was well tolerated. Antoni and colleagues evaluated the efficacy and safety of infliximab in a 54-week open-label study. Ten patients with PsA refractory to other medical interventions were administered infliximab 5 mg/kg intravenously at 0, 2, and 6 weeks, with individualized dosing after 10 weeks . Patients were assessed at 2, 6, 10, and 54 weeks, and magnetic resonance imaging (MRI) was performed at 0 and 10 weeks to measure joint inflammation. All patients demonstrated an ACR20 response by 2 weeks, and eight patients improved to demonstrate an ACR70 response at 10 weeks, which was maintained to 54 weeks in six patients. At 10 weeks the PSAI scores were significantly improved with infliximab (P = 0.003) in this last subset of six patients, with a mean 71.3% reduction from baseline. The MRI at 10 weeks showed an 82.5% mean reduction in inflammation from baseline. There were no significant adverse events, severe infections, or infusion-related reactions. The positive results in these small studies led to the design of the Infliximab Multinational Psoriatic Arthritis Controlled Trial (IMPACT), a 16-week, multicenter, multinational, double-blind, placebo-controlled study in 100 patients with active PsA who failed therapy with one or more DMARDs . Patients were randomized to receive infliximab 5 mg/kg intravenously at 0, 2, 6, and 14 weeks, or placebo. After completion of the randomized, controlled phase of the trial, patients were eligible to enter an open-label follow-up phase during which infliximab was administered at 8-week intervals for up to 2 years. Sixty-nine patients were taking concomitant DMARDs, and 56 patients were taking methotrexate. At 16 weeks, an ACR20 response was reported in 69% of infliximab-treated patients compared with 8% of controls (P < 0.001), an ACR50 response was reported in 49% of infliximab-treated patients compared with 0% of controls (P < 0.0001), and an ACR70 response was reported in 29% of infliximab-treated patients compared with 0% of controls (P < 0.0001) (Fig. 2) . Analysis showed no differences in ACR results in infliximab-treated patients who were or were not taking concomitant methotrexate. Evaluation of a subpopulation of patients with psoriasis over 3% or more of their body surface area showed that infliximab-treated patients demonstrated an 81% improvement in PSAI compared with a 35% worsening in controls (P < 0.001). Infliximab was well tolerated, with no difference in the incidence of adverse events from placebo. There were no serious infections or cases of tuberculosis, and there was one discontinuation of the drug owing to an infusion-related reaction. 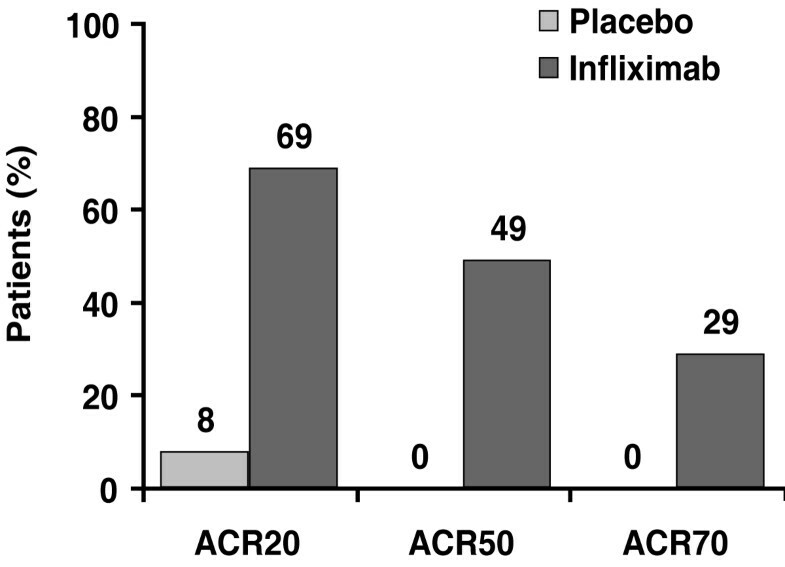 Percentage of infliximab- and placebo-treated patients demonstrating ACR20, ACR50, and ACR70 responses at 16 weeks. ACR, American College of Rheumatology. P < 0.0001. Reproduced with permission from . PsA is a chronic, progressive disease that tends to respond poorly to several currently used agents. Biologic response modifier therapy with TNF antagonists represents a major step in improving functional outcomes in these patients. So far, etanercept has been approved for the treatment of active PsA. However, both infliximab and etanercept significantly improve the clinical, laboratory, and statistical markers of cutaneous and articular disease. Both agents are safe and well tolerated. Issues currently under study with the TNF antagonists include the optimum dose and schedule, patient selection criteria, the effects of concomitant therapy, and the role of these agents in preventing structural damage.